Word recently got out that all TED employees are forced to take a two week summer vacation. Like a classic TED talk, this seemed like a very good idea. But if, during this lull in TED coverage, you&apos;re missing those big ideas and challenged expectations, never fear. TED&apos;s new material is always good, but their greatest talks have one thing in common: They&apos;ve been about music. Here are 11 brilliant TED talks that will change how you think about music. Robert Gupta, a violinist and doctor, proves in this talk that the worlds of music and health are deeply and intrinsically tied. With examples of the healing powers of music therapy on people with mental illnesses, Gupta makes the point that music helps us transcend our own bodies and reminds us of the beauty that exists in the world. Tod Machover of the MIT Media Lab believes that only when you play music can you actually reap its many intellectual and spiritual benefits. Of course, not everyone has that luxury. But he has a solution. He&apos;s built a series of instruments that both complete amateurs and virtuosos can play. Most significantly, though, his instruments allow people with mental and physical disabilities to access the greatest art of all. Dr. Charles Limb explains the mysterious science behind hearing music. It&apos;s more than just a physical sense — people who are born deaf and receive a cochlear implant can hear, but they can&apos;t quite process music. That reveals one fundamental truth: Music transcends mere physical sense. Scott Rickard&apos;s talk about the ugliest kind of music relies on a weird old invention — pattern-free music was developed for the military originally in order to find the perfect sonar ping. And it sounds truly awful. But the math behind generating a song that seems to have no structure is beautiful in its own right. It isn&apos;t so much that there is no structure — it&apos;s just that the structures are so meticulous and exact that humans can&apos;t quite make sense of them. It&apos;s a different sort of beauty. All the best musicians have hit a period of extreme writers block. Even the greatest pop songwriter of the &apos;80s. Police front-man, Sting&apos;s story of his intense writer&apos;s block is instructive for any creative person. He learned that he could only begin writing again when he started writing songs about the people in his community. Because music is about personal stories, and the universal truths they reveal. Music producer and DJ Mark Ronson may have ushered in the new era of soul with Amy Winehouse, but he knows his stuff when it comes to modern dance and hip-hop music. He shows how sampling has totally changed how we think about music. Whereas in eras past we might have criticized artists who didn&apos;t write a whole song themselves, we now accept samples as a new kind of instrument, almost, one that plays time. Musician/Inventor Beardyman wants us to break out of our obsession with standard instruments by going back to basics: making weird voices with our own mouths. 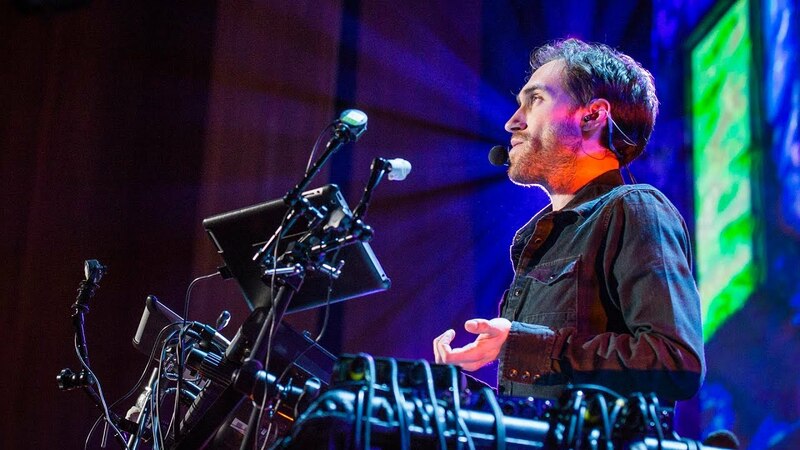 Using a nifty looping tool to manipulate layered tracks of your own voice, Beardyman makes an orchestra from the sounds most people would leave in the shower. Jared Ficklin shows the physical properties of sound by displaying them visually with fire and waves of color. The amazing takeaway, though, is that we actually already see audio in our day to day lives without knowing it. And when we link what we see and what we hear, music becomes another art form entirely. These days, the music industry is obsessed with making a music video with the same budget and "wow" factor as a feature film. It sounds simple, but few realize just how essential a special kind of music video has become to a fundamentally changed music industry. To even get a crack at being signed, young bands need compelling videos to get noticed by influential bloggers who, in turn, need compelling media to get traffic. A good video is at the heart of it all. Designer and former DJ, Jakob Trollback demonstrates the power of a music video that visually defines and showcases the song itself instead of the singer him or herself. Clayton Cameron, a jazz drummer who has toured with Sammy Davis, Jr., and Kenny Burrell, explains the amazing mathematics behind a beat — they form a dense series of relationships on which the whole structure of a song can rest. With the help of his brother, musician Ryan Holladay, has created pieces of music that only play via a cellphone when the listener stumbles upon a certain geographical locations. Using technology, he turns the world into a place where music is hidden, waiting to be uncovered.